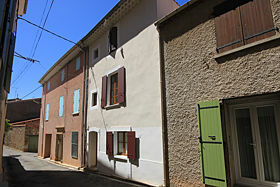 Maison Felix is a beautifully renovated village house, whose terrace overlooks the river Vernazobre. The house is tastefully furnished, and every comfort has been thought of. Upon entering the house you step into a hallway. The door on the right leads to a WC; a storage cupboard off the hallway houses the fridge/freezer and allows you to store bulky items. The door at the end of the hallway leads into the open plan living area. The fully fitted kitchen is at one end of the room, overlooking the street, and is equipped with electric cooker, electric kettle and toaster. A good selection of cookware and crockery will allow you to make the most of the fresh local produce available in the twice weekly farmers market. The dining table is right next to the kitchen. The sitting area is at the other end of the room and is comfortably furnished with two easy chairs. From the sitting area, French doors lead to the terrace, which overlooks the river Vernazobre. The terrace is furnished with a dining table and chairs, two easy chairs and sun umbrellas. View of Maison Felix from the other side of the river. On the first floor you will find the TV room, which is furnished with a sofa (can convert to a bed), a flat screen Television and a desk and chair. The TV receives a selection of French, and international channels. Also on the first floor is the large bedrooom, which is furnished with a double bed (140cm x 190cm), night tables and a wardrobe. Next to the bedroom is the shower room, with a large walk-in shower, WC and wash hand basin. On the second floor is a laundry room, where you can find a washing machine, iron and ironing board. Maison Felix is well equipped for a perfect holiday. Click here or more information about Saint-Chinian.